The biggest and brightest galaxies in the universe aren't what we thought they were. Astronomers from the California Institute of Technology have discovered a massive new kind of galaxy, which they now call a “super spiral.” These galaxies give off bright light that can shine up to 14 times that of the Milky Way Galaxy. Simply put, super spirals are enormous. They have diameters that can measure up to 437,000 light-years. For comparison, the Milky Way is just a little over 100,000 light-years across. And they can weigh up to 340 billion solar masses. The massive size also means that super spirals can give off an incredible amount of ultraviolet and mid-infrared light. To that end, the galaxy has a very high rate of star formation, generating new stars 30 times faster than our galaxy. The discovery was made by a team of astronomers led by Dr. Patrick Ogle, who write that they had chanced upon the galaxies in the NASA/IPAC Extragalactic Database (NED) while in search of other extremely luminous and massive galaxies. mages of super spiral galaxies. Examples with peculiar morphology: (1) multi-arm spiral, (8) asymmetric two-arm spiral, (21) ring galaxy, (23) possible tidal arm, (33) asymmetric disk, (34) possible secondary bulge, (53) partial arms or shells. Image credit: SDSS. The team of astronomers had expected to find ellipticals (large, mature galaxies) in searching NED, but instead they happened upon this new discovery. This came after sampling around 800,000 galaxies, all within 3.5 billion light-years from the Earth, they found that the most luminous galaxies here not elliptical in shape, but rather spiral. 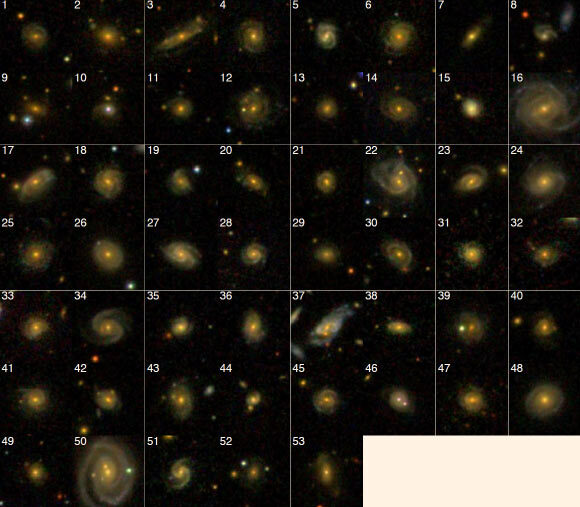 A distinct trait observed in 4 of the 53 super spirals discovered by the team is that they contain two galactic nuclei, potentially hinting at the origin of such galaxies—a collision of epic proportions. As the team notes, “double nuclei are a telltale sign of two galaxies having just merged together. Conventionally, mergers of spiral galaxies are destined to become bloated, elliptical galaxies,” but the merging of two gas-rich galaxies could possibly lead to their combined gases settling into a super spiral. This discovery changes conventional understanding of how massive galaxies form and evolve. Their study is published in the Astrophysical Journal.